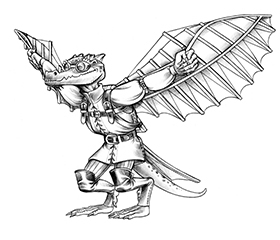 With the release of Advanced Races 5: Ravenfolk (available at DriveThruRPG and Paizo), it’s time to take a crack at bringing this avian race into 13th Age. I enjoyed converting the darakhul and gearforged, but I’m especially excited by the ravenfolk because this book is my first solo design project for Kobold Press! Our ravenfolk are Western cousins of the tengu, shapeshifting creatures out of Japanese folktales. In Midgard these creatures are the trickster children of Wotan, and sacred warriors of hawk-headed Horus. The racial ability and feats reflect this Midgardian identity. Once per battle you can reroll a natural even attack roll, or natural even skill check. Champion Feat: You can use Wotan’s wisdom twice per battle. Epic Feat: You can now use Wotan’s wisdom to grant an ally a reroll. 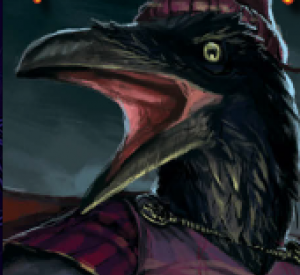 Ravenfolk Adventurer Feat (Carrion Crow): At one time you embraced the aspect of ravens as heralds of death and went to dwell among Midgard’s undead. You returned with terrible knowledge. 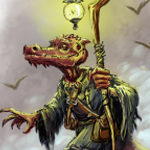 You gain a +2 bonus to knowledge skill checks related to undead, the Principality of Morgau and Doresh, and the Ghoul Imperium. You also gain a +2 bonus to AC against negative energy attacks. Champion Feat: The AC bonus increases to +4. Epic Feat: The AC bonus increases to +6 and you gain turn undead as the 1st level cleric spell. If you’re already a cleric, gain an additional use of the spell per day. Ravenfolk Champion Feat (Glide): You can fly at the rate you normally move until the end of your turn. Epic Feat: You can now fly until the end of your next turn. Ravenfolk Adventurer Feat (Astounding Blade): Once per battle if you are using a sword in combat, you can deal 8 points damage to 1d3 nearby enemies as a quick action. If you’re fighting mooks, add together any excess damage and apply it to any mooks left standing until you run out of damage, or run out of mooks. Champion Feat: You can deal 10 points damage to all nearby enemies as a quick action. Epic Feat: You can deal 15 points damage to all nearby enemies as a quick action. Ravenfolk Adventurer Feat (Scion of Horus): You claim kinship with the hawk-headed god Horus, princely foe of ancient demons and their cults. Your crit range against demons and creatures in their service expands by 2 (normally 18+), and every attack you make deals holy damage instead of other types of damage unless you choose otherwise for a specific attack. Champion Feat: Your expanded crit range against demons and creatures in their service is now 4 (normally 16+). Epic Feat: Your expanded crit range against demons and creatures in their service is now 6 (normally 14+). The ravenfolk are known as scoundrels and plotters; they are not entirely trusted, but have a reputation for never breaking an oath. Their homeland is Beldestan to the East, but they can be found on Wotan’s tree and the high cliffs of the hidden temple of Horus in the South. They are known as heru or heruti in the south, and huginn everywhere else. Great work, Wade. I should’ve known you’d be kind enough to do a 13th Age conversion for us. I picked up the book last night, thinking I’d need to convert some stuff over for my 13th Age campaign, but now the work is already done. Great work Wade! I love the book and 13th age conversion. 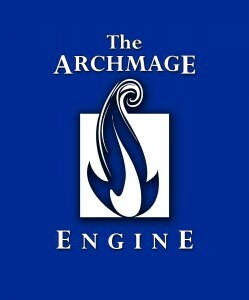 I love how well 13th age fits with Midgard and can’t wait to see more material. Love the Carrion Crow feat!